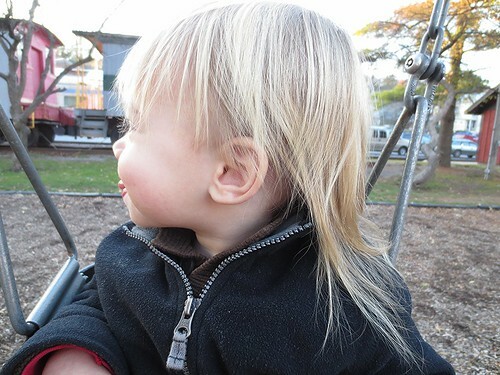 I'm not really sure how I allowed my son's hair to get this long? But I'm curious what, if anything, you find offensive about this picture? Is it because the mullet is so mullet-y? Or is it because his bangs are obviously hanging in his eyes? Either way is this a mom fail? Probably. I'm a big success when it comes to failing. What I do know is that I put off cutting Henry's hair for months. To be honest, in the end it wasn't even the mullet-y mulletness that got us into the salon, it was the hanging in the eyes bit. Because if there's one thing Hank is all business about it's partying and he needs to see what's doin' to make that happen. So he got his hair did and Violet was so enamored by the whole process she ended up getting hers done too. This was also her first haircut. I don't know, after that hairy business back in January maybe my reticence was because I'm just all hair-cutted out for 2012? Anyway, here is Hankster after the big chop.